While the rest of the chess world is focused on the FIDE elections and on the World Chess Olympiad in Khanty-Mansiysk, and American chess is focused on the US Chess League, I’ve been enjoying a chess break. No study, no tournaments, no ChessLectures (with apologies to my two or three fans out there who actually look forward to them). However, I’ve kept going with my chess club for kids at the Aptos Public Library. At this week’s meeting I started a new book with them, John Emms’ The Ultimate Chess Puzzle Book. I actually bought Emms’ book mostly for myself. In my last game at my most recent tournament, I threw away a win by playing a combination that I should have resisted. It looked as if I would win two pieces for a rook, but my opponent (Ruth Haring) saw one move deeper than I did and saw that she could get a piece back. After that game, it occurred to me that most books on tactics show you dozens and dozens of positions where the tactical tricks work. But there aren’t nearly as many books with examples where there is a tempting trick that doesn’t work, and the correct solution is to resist temptation. Refreshingly, Emms has a chapter called “Find the Wrong Move!” that addresses that exact issue — you’re supposed to find the clever tactic that doesn’t work, and figure out why it doesn’t. Of course, the fact that these are collected into a chapter called “Find the Wrong Move!” gives you a hint. During a real game, you won’t know whether the clever tactical idea you’ve just spotted works or not. So I hope that Emms will also sprinkle a few other “Find the Wrong Move” examples, unannounced, into the other chapters and tests. As the title suggests, the book consists of 1001 puzzles with solutions. The puzzles start out very simple. Even though most of the book will probably be too advanced for the kids at the Aptos Chess Club, I felt that at least the first couple chapters (“Elementary Puzzles” and “Checkmate Puzzles”) would be accessible to them. At this week’s meeting we solve puzzles #1 and #3. The first puzzle was a mate-in-one that the kids solved pretty quickly (although not right away). But puzzle #3 was already kind of interesting. The first move that the kids suggested was 1. … Rxc8, and indeed this is the move that I expect a lot of chess players (and not just beginners) would play automatically. The rule that I tell the kids is to look at checks and captures first, and this is consistent with that rule. What’s interesting is thatÂ 1. … Rxc8 is not such a bad move. After 2. Rxc8+ Ke7 White is really hard put to stop the several back-rank mates that Black is threatening. It took a long time before the kids figured out that White has to play 3. Qh4+ f6 4. Qe1 to put out the flames. I thought that was a pretty direct hint, but still it took an unexpectedly long time for them to work it out. They kept proposing moves like … Bb7 and … Bc6 that basically do nothing. Finally, though, one kid came up with 1. … Qxc1+! !, which is of course the correct solution. Then there was great joy and excitement when the other kids figured out that Black wins after 2. Rxc1 Rd1+ 3. Rxd1 Rxd1 mate. This was a great beginning. I am surprised that Emms put such a challenging puzzle as #3 in “Elementary Puzzles,” because for my kids it was really tough. But I was glad that they finally solved it by themselves — I didn’t have to show them the moves — and I was especially glad to see how excited they were when they figured it out. Even if it took 20 minutes to get to that point. There is another interesting conundrum to me as a chess teacher. How important was it for me to insist that they look for something better than 1. … Rxc8? In point of fact, I think that the simple rook trade would be a winning move for Black 99 percent of the time in a kids’ game. It’s an axiom that kids can’t defend (in fact, Brian Wall in his discussion list goes farther and says that humans don’t know how to defend! 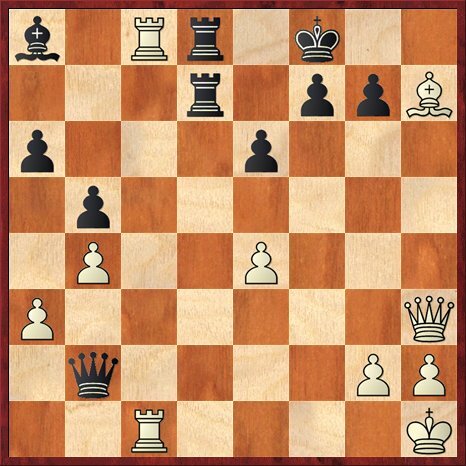 ), and so very few White players would have found the idea of Qh4+ followed by Qe1. And even if White does find this variation, Black still stands better. So is it worth it for the kids to spend 20 minutes looking for the absolutely decisive continuation, when instead they could spend 1 minute and play a move that would win 99 percent of the time for them, and probably at least draw the other 1 percent? During the lesson, while the kids were struggling to find the winning combination, I was seriously asking myself these questions, but after they finally figured out the solution, I felt that I did do the right thing after all. The whole point of chess is that it’s hard sometimes (most of the time? all of the time?). There are so many things in life that we simplify for our children, but it’s by accepting the hard challenges that you learn and understand the most. I hope that my kids, somehow or other, will sense the honesty of chess. 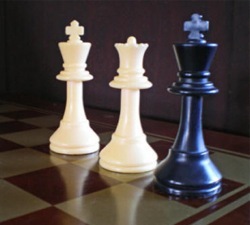 The way to improve in chess (I think!) is to look for the truth about the position, not just to settle for an adequate move that would sorta kinda win most of the time. Later on, maybe, we can talk about the fact that chess isn’t always so clear-cut, that many times there is no “objective truth” about a position, or the truth is hidden behind seven veils and sometimes you have to settle for a rough approximation. nice post, the second part is more of an illumination of how kids handle chess, but you’ve done that before in your library stories, and it’s always interesting in a way.